On 22 June 1948, the former German cruise liner Empire Windrush arrived in the UK, carrying 492 passengers from the West Indies. Mainly former service personnel, this was the first wave of post war immigration with many of the passengers taking up roles in the NHS, which launched just two weeks later. The journey of the early black and minority ethnic (BME) colleagues in the NHS, and in British society, was not an easy one. Faced with overt racism, discrimination and public outcry, they were not always welcome. The same experiences were faced by those that followed over the next few decades. Today, people of BME backgrounds make up almost a quarter of an NHS workforce which is currently represented by 202 nationalities. 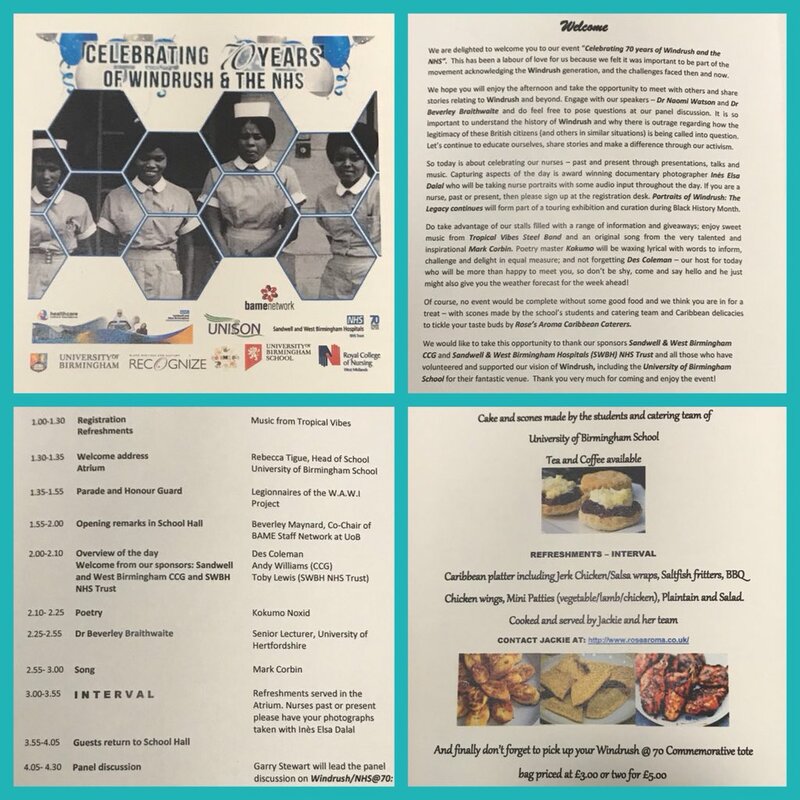 In June, the BME staff network joined forces with the University of Birmingham BAME staff network, University of Birmingham School and Recognize Black Heritage & Culture to host a celebration to mark the 70th anniversary of Windrush. Over 250 people attended the event, which was hosted by ITV Weather Presenter, Des Coleman and sponsored by Sandwell and West Birmingham CCG. Assistant Primary Care Manager and Co-chair of our BME Staff Network, Donna Mighty was a member of the organising committee, she explained more about the event to Heartbeat. Guests at the event were treated to afternoon tea, which was made and served by catering staff and pupils from University of Birmingham School and listened to music by Tropical Vibes Steel Band, before they made their way into the great hall for the start of the celebrations. The event started with a parade and honour guard from legionnaires of the W.A.W.I project, before Beverley Maynard, Co-Chair of the University of Birmingham BAME Network addressed the crowd, before Accountable Officer at Sandwell and West Birmingham CCG, Andy Williams, followed by our Chief Executive, Toby Lewis, took to the stage. Toby said: “As we stand in this fantastic building, our job today is to reflect and say thank you, but also to look to our children and the next generation and teach them some stories and share a sense of inspiration about what human beings can do when they come together. Toby went on to share the story of a ward manager who has worked at City Hospital for a long time who told him that she wouldn’t recommend working as a nurse in the NHS to her children, due to the way that she and others of her generation had been treated. 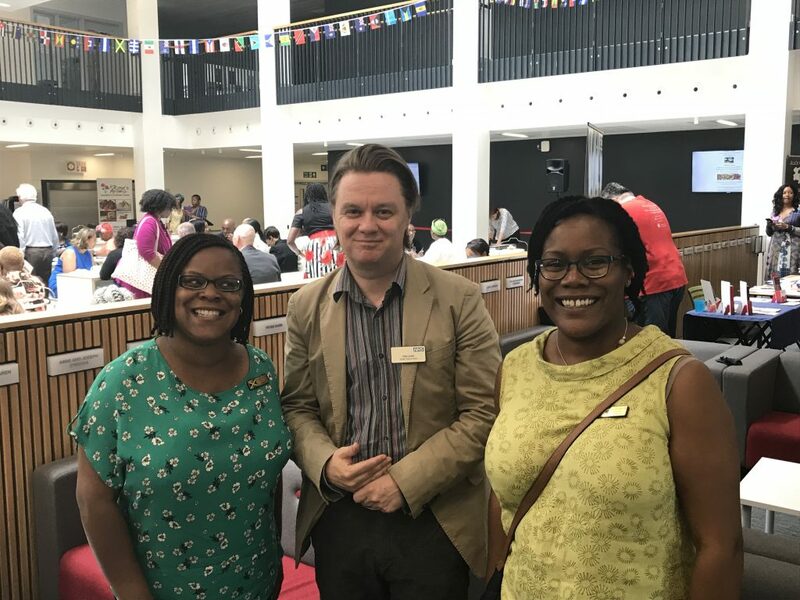 Guests also heard from poet, Kokumo Noxid, singer, Mark Corbin and Dr Beverly Brathwaite who talked about the impact BME nurses had had on the NHS. They also enjoyed a platter of typical Caribbean food, including jerk chicken, salsa wraps, salt fish fritters, barbeque chicken wings and mini patties. Volunteer Service Manager, Pat Hunt, whose mum came from the Caribbean and worked as a nurse auxiliary (what we now know as a HCA) at Summerfield Hospital – now known to us as City, attended the event and thought it was wonderful. She said: “I just know mum would have loved the celebration of Windrush and the NHS turning 70. “It was great to be in the presence of so many retired, semi-retired and working Caribbean nurses and listening to stories of how and why the NHS needed them. “The steel band, Tropical Vibes were excellent and certainly bought a real Caribbean feel to the event. The cakes that the pupils made were delicious.